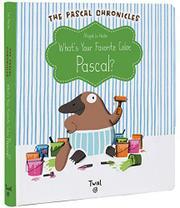 WHAT'S YOUR FAVORITE COLOR, PASCAL? It’s spring! Pascal the platypus wants to bring the season into his home by painting his room. But when his friends offer advice and help him out, nothing is straightforward. Pascal lives in a nautically inspired underground home. Blue and white are the main colors, but when spring arrives he feels like a change. When he asks his friends to help him choose the best color, everyone has an opinion. Cardigan the rabbit suggest orange. As the friends cover over the blue and white with orange, turtle Fancy declares that it looks like a carrot and suggests green instead. The friends turn the room green, but Zelda, a frog, doesn’t like the change. She suggests pink. As the room turns pink, big, brown dog Ringo does not like it. He believes all the colors would be best. “Sploosh! Splat!” Now “Pascal does not like it—not one bit!” He takes his shovel and does what he does best: he makes himself a new home. And what color is it? Blue and white, just as it was before. As the room changes colors readers can follow along lifting the flaps to peek inside a closet, a cabinet, the bathtub, and even behind the pictures on the wall. Observant readers will also have fun following the mice that share Pascal’s home.